After a disappointing escapade with beer can chicken (he tried 3 different beers, smoked the chickens for over an hour, and they all tasted exactly the same: like smoked chicken), we have a fridge full of chicken. 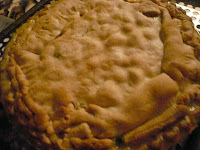 So of course, chicken pot pie came to mind, and it suited our first fall weather. I believe this is the first time I can remember September in Austin being pleasant. 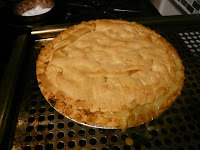 This is my base recipe for pot pies, with a little cheating on the crusts. But from this I've done many variations with vegetables like spinach, potatoes, and this time okra. I'd like to try using chipotle some time, or curry with a potato, samosa-like filling. Defrost the crust and bake one for ~8 minutes so the base will retain its crisp. Mix together all other ingredients, pour into pre-baked crust. Invert other crust on top and carefully pry off its aluminum pan. Press the edges to seal in your gravy, but expect it to boil out anyway and mess up your oven (as illustrated below). Bake at 375 for 40 min to an hour, and keep an eye on the crust to be sure it doesn't burn. One final note-if you prefer less gravy, you can leave out the milk.